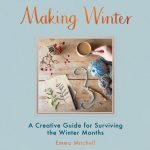 Emma Mitchell is publishing a book called Making Winter: A Creative Guide for Surviving the Winter Months. Her book launches on the 5th of October. We interview her and offer a special event to celebrate.